Top Ten Tuesday is a weekly meme/feature hosted by The Broke and the Bookish. This week’s topic is: Top Ten of the Most Unique Books I’ve Read. I love unique books. I mean, who doesn’t? Reading the same old story over and over again can get really boring, so it’s always nice to find those books with unique plots that really stand out. Now, there are a lot of books with unoriginal plots, but that’s not a bad thing! 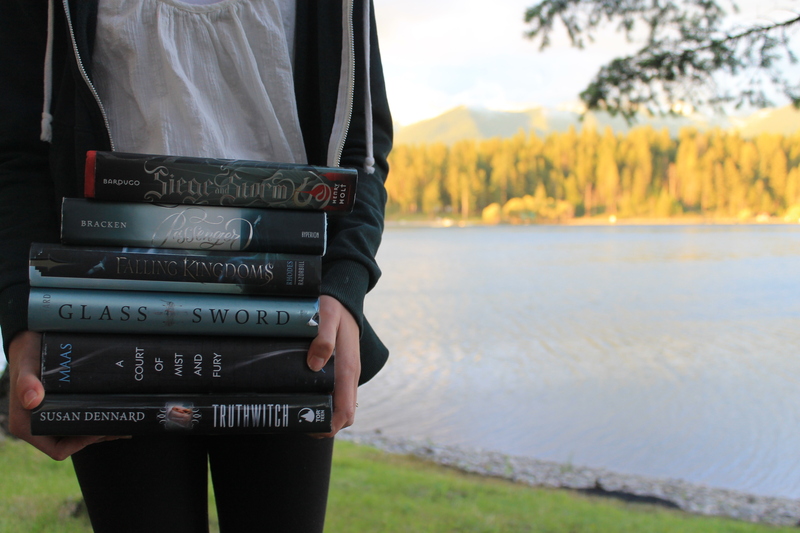 I love reading books set in fantasy worlds with wars and kings and queens (for example: Throne of Glass, Falling Kingdoms, etc. ), but it can get tiring at times. One of my favorite things is when I find a book with all these elements I love that still manages to have a very unique plot. A Darker Shade of Magic is one of my new favorite books. I think what really makes it unique are the characters and the world. I absolutely love the premise of having four different Londons, each one very different but still the same. All the characters are very original too. We have Kell, who can travel between worlds (which is actually amazing), and our favorite crossdressing pirate Lila Bard (one of my favorite characters, too). I remember reading Cinder for the first time years ago and thinking how unique it was. A sci-fi fairytale retelling with a cyborg as the main character? Who’s best friend is a faulty android? And crazy people who live on the moon with super cool powers? Yeah, I think it’s safe to say this book is pretty unique. I’ve read many sci-fi books, but none as unique and original as this one. Okay, Illuminae wasn’t my favorite book (I actually didn’t like it at all. It was really hard for me to read), but I loved the format. I think the format was also hard for me though because I was so confused. Still, the format in this book si so unique and original, I love it. It’s told through various reports and emails, etc. It’s actually really cool, I just wish I had enjoyed the book. At this point you all probably know how obsessed I am with The Raven Cycle. I read it last year and it was instantly a favorite of mine. It really bothers me when I see people saying the plot is unoriginal because like?? It’s about an amazing group of best friends who all love each other so much that are on a hunt to find a dead welsh king. Not only is the friendship and the characters really unique, but so is the storyline. Shatter Me was another one that just didn’t work with me. However, the writing was beautiful. I didn’t like it, in fact it kind of annoyed me. So why am I saying that it’s beautiful? Well it was so unique and original, which made it beautiful. I loved the way Mafi would describe things in such rich detail, but there were other things about the writing in this book I just didn’t like. Last but not least, another one of my most favorite books. Actually, Six of Crows is one of my three most favorite books (tied with Salt to the Sea and ACOMAF). I loved Bardugo’s earlier books, the Grisha trilogy, but the story wasn’t the most unique. But Six of Crows is about a group of criminal teenagers going on a heist and it’s so cool. Not only is the story unique, but all the characters are compeltely original and unique too. Those are my top seven unique books! What are your favorite unique books? Any I forgot? Make sure to link your TTT post below as well! I had Illuminae on my list too but I actually loved the book though I totally understand where you are coming from, maybe listening to an audiobook version could be better if you were interested. I agree with you with Shatter Me, I enjoyed the book but I did feel that it was somewhat annoying especially since I hated the main characters voice. A Darker Shade of Magic is one of my favourite books! I also loved the Raven Cycle. Wasn’t so keen on Cinder, but I’ve been convinced to give Scarlet a try. Six of Crows and Illuminae are on my list, too! And I can’t believe I STILL haven’t read A Darker Shade of Magic. Everything I hear about it just makes me want to read it more! Here’s my TTT. I agree with all of these, except Shatter Me, which I just didn’t enjoy. BUT, I did think it was really creative of Mafi to show Juliette’s character development in that way! It was very clever! I personally loved Illuminae’s formatting, but I know it’s not for everyone! Great list! I loved The Raven Cycle and Cinder. I even considered adding both of them to my list this week, but I ran out of spots. Illuminae is one I hope to get to soon. I have seen it on a ton of posts today.